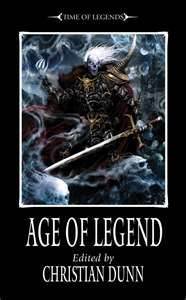 There are ten short stories collected here under the Time Of Legends series banner. Most of the authors you might recognise as BL regulars, with a couple of new ones thrown in. Sitting here now in my tiny garret writing this review, I find myself reaching for the book to remind myself of what’s in it. The stories are that memorable. Ah yes, here we go. Most of the stories involve pointless bloodshed, with slight plots, little characterisation and weak, telegraphed and/or nonsense endings. The only story that stood out to any degree was by one of the newbies, at least to me, Philip Athans. â€œThe City Is Theirsâ€ is a story about a city besieged by Orcs and in danger of being over-run. An alchemist appears before the city’s rulers with two strange spheres he claims can wipe out all the greenskins in one go. The first sphere succeeds only in bringing down the city wall, and soon the inhabitants are running for their lives. It’s down to KÃ¤tzchen, a halfling, to take down the last bridge to give the townsfolk time to escape. Otherwise, there is nothing here to see that hasn’t been seen before. Eight quid for one half-decent story is a bit steep. I’d give this one a wide berth, if I were you.